Screenshot of PSAL Web Page. It looks like big Northwest Coast projects on old sites are in the works at Oregon State University. I came across a new blog which is the public face of something called the Pacific Slope Archaeological Lab with the mission of “Discovery, recovery, and interpretation of First Americans archaeology in the New World’s Far West.” The blog points to a large number of projects which have been initiated or are planned under this research umbrella. How is such a wide-ranging and ambitious research project possible? A million dollar endowment making a fund under the direction of OSU Associate Professor Loren Davis isn’t hurting. Salmon lice infestation. Source: Georgia Strait Alliance. I’ve just dipped into an interesting paper (PDF) by Sarah Campbell and Virginia Butler, which explores 7,500 years of relationship between First Nations and Pacific Salmon. While, as ever, the archaeological evidence is discontinuous and somewhat patchy, the authors reach profound conclusions that go far beyond the usual archaeological focus on the past, as if the past still exists other than in the present. I talked once before about the “Clovis Comet” theory, which suggested the widespread extinctions of megafauna in North America at the end of the last ice age was caused by a large comet impact. At the same moment, the highly distinctive “Clovis” archaeological culture was terminated. It was suggested this comet might have either airburst or struck the ice sheets, in either case not causing a visible crater. However, abundant “nanodiamonds”, said to be highly diagnostic of an extraterrestrial impact, were found at a widespread boundary layer roughly associated with the end of Clovis – the start of the Younger Dryas cold period when the earth was suddenly thrust back into near-glacial conditions. So, I said then and I’ll say again now: this theory didn’t pass the sniff test from the beginning because it is another example of “Clovis exceptionalism” – the skeptical leeway that the Clovis-First model of first peopling of the Americas has been afforded by segments of the archaeological community. No Clovis model was so implausible that it wasn’t given much respectful beard-stroking by the usual silverbacks. Top notches in a standing western red cedar tree, the result of extracting one or more planks. Dana sent me a note that the 33rd annual meeting of the Society of Ethnobiology “The Meeting Place: Integrating Ethnobiological Knowledge”, will be held 5–8 May, 2010, in Victoria.I believe some “rockwashy” types are helping out with the organization. It sounds like a great conference and a chance to build networks between plant people and rock people and bone people – and we sure do need a lot more archaeology of plants out here on the NW Coast, where bones and stones still rule the day. This year’s conference theme celebrates the potential of ethnobiology to bridge disciplines, ideas, and communities, and to foster an understanding of the connections between the biological and cultural worlds. Special discussion sessions on: Teaching science through ethnobiology, Ethnobiology and ethics, Communicating environmental knowledge through media, Indigenous people’s food systems, and more! This year’s meetings will be back-to-back with the International Society of Ethnobiology congress in nearby Tofino, B.C., May 9–14. 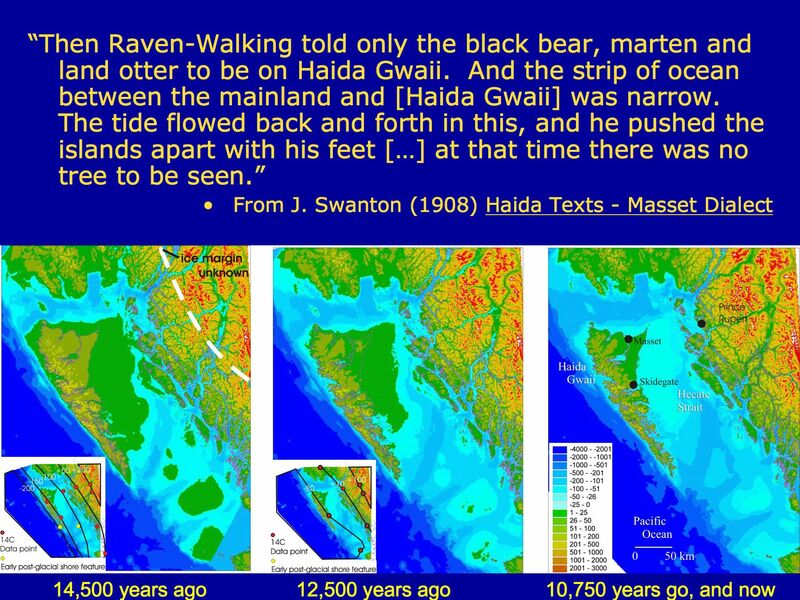 Haida History starts at least 14,500 years ago. 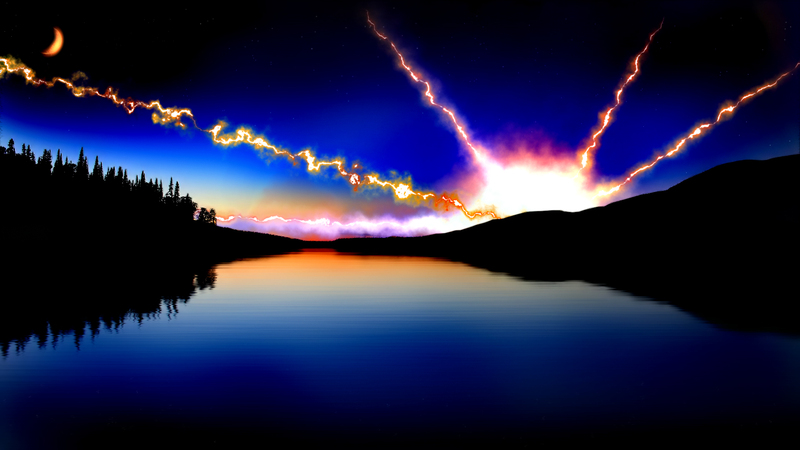 (Image credit: Daryl Fedje). 1. About 14,500 calendar years ago it was a temperate tundra environment, with no trees. The first trees, pine, appear about 14,000 years ago and there is progressive forest infilling thereafter, with the modern species mixture in place by about 3,000 years ago. 2. It has an impoverished suite of large land mammals – historically, these were limited to black bear, caribou, marten, ermine, a vole and a shrew. We know that 13,000 years ago there were also deer and brown bear on the islands, and quite likely other species as well. 3. It used to be much larger than in the present. With lower sea levels at the end of the last ice age, Hecate Strait was largely dry land, exposing a large, unglaciated, coastal plain that became rapidly flooded. Seward Peninsula Mastodon Tusk – “too old”, therefore Too Old. Worked 35,000 year old mammoth tusk from Alaska. Note scale! Source: Gelvin-Reymuller et al. 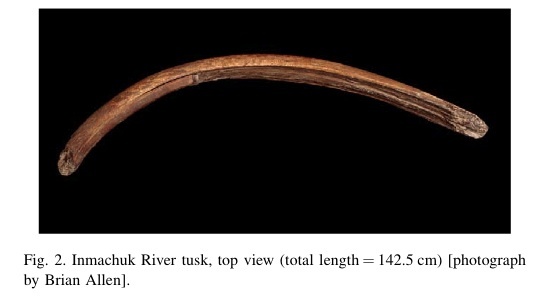 Though the age of the tusk is only peripherally relevant to the signiﬁcance of the reduction described in this paper, the tusk was sampled for dating. A single bone collagen sample from the tusk was dated by Beta Analytic, Inc. following standard pretreatment and analytical procedures. 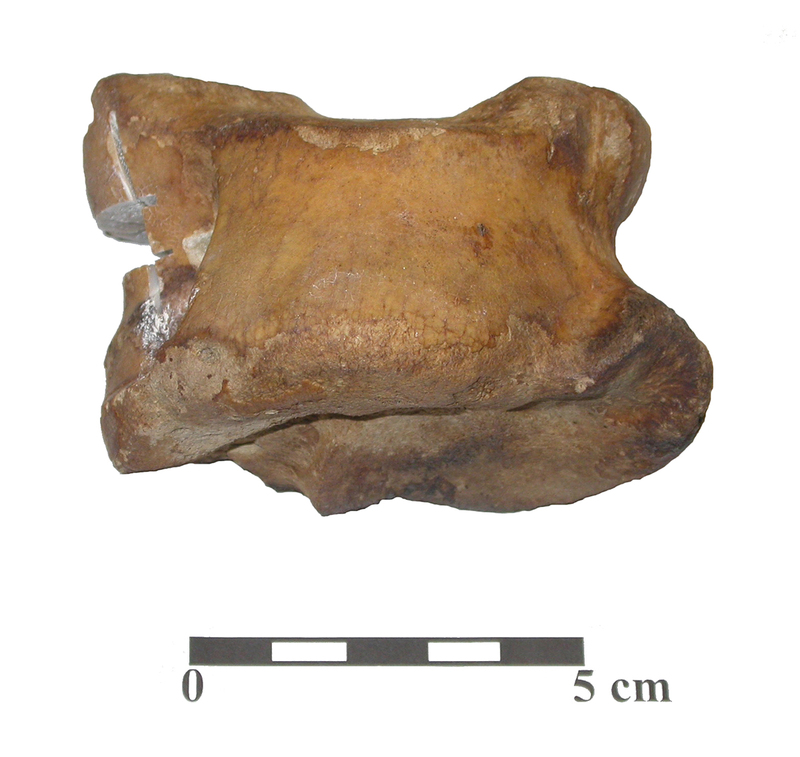 A 5.2 g of sample was ﬁrst removed from an inner area, well beneath a surﬁcial treatment of Elmer’s Glue-All which the tusk’s discoverer had initially applied to the surface. The resultant AMS date was 35,150 +/- 530 BP (Beta-189092). …… The latest mammoth remains in mainland Alaska are dated to around 11,400 BP. Since the age of this tusk places it beyond the range of initial human habitation in the New World, as currently understood, we posit that the tusk was worked by later inhabitants of the area. The authors note that it is possible to diagnose from the reduction strategies used whether ivory was worked when fresh/green or when already subfossilized, though curiously they draw no such conclusions about this particular piece. I find it intriguing how a central Beringian artifact made on a 35,000 year old material is so readily characterized as a recent manufacture. While this piece would pre-date the earliest known record of extreme NE Asia and while I wouldn’t second-guess the authors nor impugn their motives and while it is certainly possible that a fossil mammoth tusk was worked at a much later date, I’m, uh, just sayin’. This paper is interesting on a number of levels, not least as an example of stickhandling around competing paradigms. 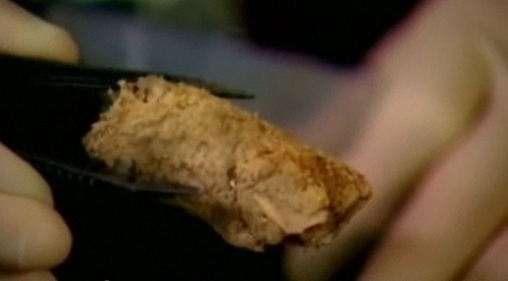 Paisley Cave human coprolite dating older than 14,000 cal BP. Source: PBS. The dating of the bone tool, and the finding that the sediments encasing it range from 11,930 to 14,480 years old, might put these questions to rest. “You couldn’t ask for better dated stratigraphy,” Jenkins told the Oregon meeting. Seeing the tool itself will of course be very interesting and hopefully definitive, as there is a long history of bone pseudo-tools in North American archaeology. So far this date has only been announced at an unspecified “meeting” and peer reviewed publication will be essential to form a final judgment. You can watch a PBS news clip on the poop discovery from a link here which gives a good idea of the setting of the cave, and also includes nice footage of Luther Cressman! Camel astragalus from Paisley Cave. Source: U of Oregon. Dalton, Rex. 2009. Oldest American artefact unearthed: Oregon caves yield evidence of continent’s first inhabitants. Nature: doi:10.1038/news.2009.1058.